(Reuters) – The first torrential downpour of an approaching winter has already soaked the Gaza Strip, compounding the misery of thousands of Palestinians who scrambled to patch homes wrecked by the summer war with Israel. 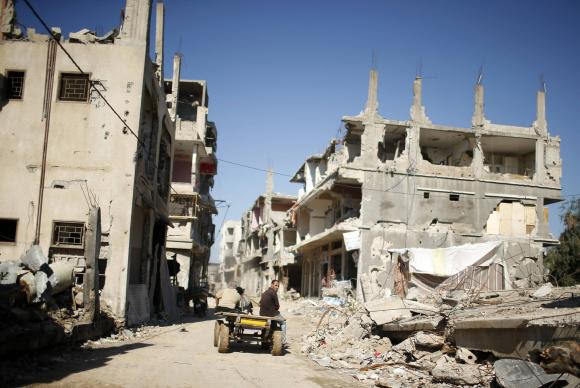 While Palestinian officials rejoiced at $5.4 billion pledged at an international aid conference last week toward reconstruction and shoring up their budget, many in Gaza fear that, as was the case after past wars with Israel, not all the money will materialize. No one disputes the need is urgent: the United Nations says 18,000 dwellings were destroyed or damaged in 50 days of fighting between Israel and Palestinian militants, and 108,000 people are homeless in a long impoverished, isolated territory. The flow of building material and other aid will largely depend on whether the Western-backed Palestinian Authority (PA) that exercises limited self-rule in the Israeli-occupied West Bank extends its writ to Gaza, now run by the Hamas Islamist group shunned by many countries as a designated terrorist group. Any chance the Palestinians will learn something from this? Nope.